The main registry of the German .DE domains, this year will show less information in the public WHOIS database. In May this year, a new law will come into force in the entire European Union regarding the protection of personal data extracted from DNS databases, where every internet user can check the identity of the domain owner and contact details. As announced on February 28, displayed information in public WHOIS will be very limited. A query of their database will return only records indicating the status of the domain, two e-mail addresses (technical and address for abuse) and technical information, such as name servers. All public polls of the WHOIS database will not contain personal data. All of this is due to the German Federal Data Protection Act. These changes will affect all (over 16 million) domains in the .DE. 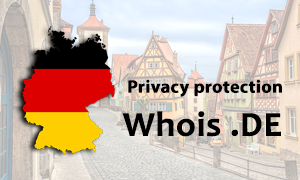 Additionally, the German Registry indicates that the WHOIS service process will be more automated. Users who have a legitimate interest in knowing the personal data of a domain will be able to request this information through a semi-automated system. This form has already been implemented at the beginning of February this year.